Over the past few years, growing your own food, and foraging for wild foods has become increasingly popular. As well as providing a bountiful supply of natural foods, which are free from harmful chemicals and rich in health-giving nutrients, our back gardens, hedgerows and woodlands can also be an excellent source of many natural medicines. Many herbs, which can be easily grown at home, or collected from the wild, can be used to make simple home remedies. Human beings have been using plants to cure illness for thousands of years, and before pharmaceutical medicines were available, people relied on herbs they grew, or collected from the wild, for their medicinal properties. Many herbal medicines are simple to make and are still surprisingly effective for maintaining good health and treating a variety of common complaints. For example, Thyme which is one of the easiest herbs to grow, can be used to make a cough syrup which is just as effective as many over the counter brands, and probably more-so. Herbal teas made from herbs such as lemon balm, chamomile and lime flowers are excellent for reducing stress and aiding restful sleep, and are gentle enough for even very young children. Nettles, dandelion and cleavers are excellent detoxifiers, and medicines made from them can be used to treat joint problems, and various skin conditions. Calendula flowers can be used to make ointments and creams that can be used to heal dry, irritated or infected skin. Next Sunday, 3rd May, I will be running an afternoon workshop on growing and foraging your own herbs and wild flowers, and using herbs at home for maintaining good health and treating a variety of common complaints. The workshop will take place at Dromana House and Gardens, on the banks of the beautiful Blackwater River in Cappoquin, Co. Waterford. This event has taken place on an annual basis for the last few years, and has proven to be extremely popular. However it is particularly significant this year, which marks 800 years of History at Dromana House. 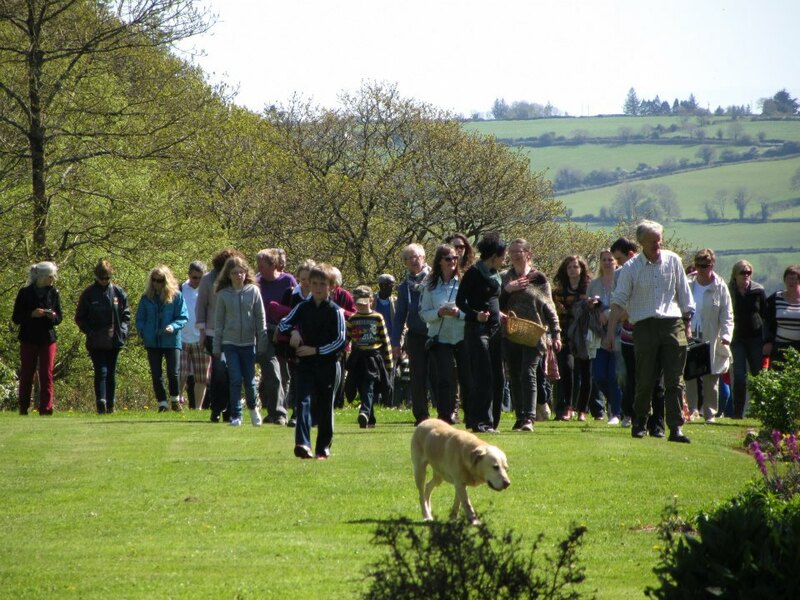 The afternoon will begin at 2pm with a talk about the benefits of using home-grown and wild-crafted medicines, and we will then go foraging in the beautiful gardens and woodland around Dromana House. After the walk, I will demonstrate how to make some simple home remedies, such as herb teas, syrups, ointments and creams. There will also be an opportunity to enjoy a cup of tea and some light refreshments, and I will be happy to answer any questions that people have about making and using herbal medicines at home. Admission is €12, and children under 12 are free. Tea and light refreshments are included. For further information or to book your place, please contact Dromana House on 024 96144. Integrated medicine refers to the practice of incorporating complementary and alternative therapies with orthodox medicine, in order to create a comprehensive and holistic approach to healthcare. It is becoming increasingly popular among both patients and practitioners. Individuals who use complementary medicine are more likely to have experienced long term health problems and had limited success in treating these problems with orthodox medicine alone. This leads people to seek an alternative approach to healthcare, in an attempt to improve the outcome. The pressures facing many orthodox medical practitioners allows little scope for the in-depth discussion of emotional or quality-of-life issues, or the development of self-care strategies, which is in contrast to the more holistic therapeutic relationship found in many alternative therapies. Complementary approaches also have an important role to play in management of the side effects of orthodox medicines. At least 40% of the population of industrialised countries now regularly use one or more forms of complementary and alternative medicine. However, patients frequently combine conventional treatment and alternative approaches, rather than using one or the other exclusively. The majority of people who use alternative medicine do so because they consider it to be beneficial to their overall health and well-being, rather than because of dissatisfaction or negativity towards conventional medicine. One form of integrated medicine is where individual practitioners offer different modalities, for example, when a GP practices complementary therapy alongside orthodox medicine. However, it can not be taken for granted that mainstream healthcare practitioners are equipped to advise upon or practice alternative therapies based on minimal training. In many cases, only the bare essentials of highly complex healthcare systems (such as acupuncture or herbal medicine) are used, which results in loss of essential features of alternative medicine, and does not necessarily represent a more holistic approach to healthcare. Many patients who combine orthodox medicine with complementary and alternative therapies do so independently. Unfortunately they do not always inform their doctor or alternative healthcare practitioner of the other interventions they use, and there is often little or no contact between orthodox and complementary practitioners, which would offer the possibility of better care for patients. Integrated medicine seems to work best when based on collaboration between orthodox clinicians and alternative healthcare practitioners. Healthcare professionals from different modalities can most successfully interact with eachother for the benefit of their patients when practitioners work as a team under one roof. Under these circumstances, communication is convenient, and individual practitioners are able to gain a better understanding of the work of other healthcare professionals, and benefit from different perspectives on what is happening with particular patients. At the Lismore Clinic, healthcare practitioners work as a team in order to provide holistic healthcare for our patients. For example, an individual experiencing emotional difficulties may combine anti-depressant Herbal Medicines with Counselling or Art Therpay, while someone with a musculoskeletal injury might combine anti-inflammatory Herbal Treatments with Chiropractic or Massage. From Thursday 2nd April, the team at the Lismore Clinic will also include Medical Council Registered General Practitioner, Dr. Noelle Quann. The General Practice surgery at the Lismore Clinic will provide all the usual medical services normally provided by GPs, such as diagnosis and treatment of acute and chronic medical problems in adults and children, routine screening, antenatal and preventative care. In addition to these services, Dr. Quann is also fully trained and experienced in a variety of specialist areas, including dermatology, musculoskeltal injury management and women’s health and family planning.